U.S. Chamber of Commerce President Tom Donahue had some unkind words for Donald Trump during the primaries. That’s all stopped. Photo: Tom Williams/CQ-Roll Call,Inc. 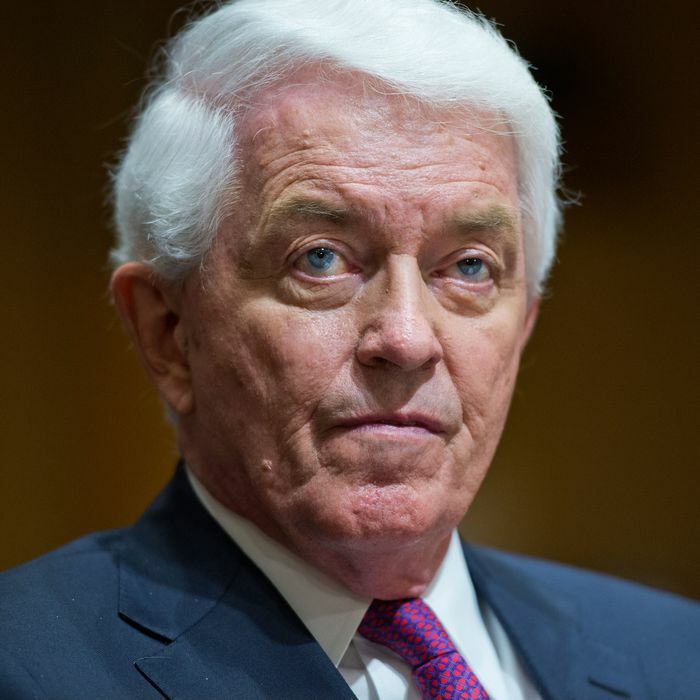 The steady drift of the U.S. Chamber of Commerce toward becoming a reliable constituency group of the Republican Party has been going on for many years. But it still represented a landmark to learn that in 2016, for the first time, the Chamber abandoned even the slightest fig leaf of bipartisanship. Every dime of the $29 million the group spent on congressional races went to Republican candidates. As recently as 2014, the Chamber was still endorsing a handful of business-friendly Democratic members of Congress. The all-in-on-the-GOP decision-making at the Chamber is all the more remarkable because of the recent trends within the Republican Party that have discomfited its business allies. Most notably, the Chamber frowned upon the tea-party movement that threatened to take over the GOP after the 2010 midterms — mostly because said movement threatened to do terrible things like forcing a national debt default, but also because the tea people tended to oppose Chamber priorities like immigration reform, trade agreements, educational testing, and infrastructure spending. Yes, the Chamber reasserted its power in the GOP in the 2014 primaries, but many of the very things that upset business interests about the tea party were subsequently championed in a big, violent way by Donald Trump. The Chamber’s longtime president, Tom Donahue, got into a brief but intense war of words with Trump during the primaries over trade and immigration policy, and the hatchet was never really buried. So why did the Chamber go so deep-red in its political spending? It’s pretty simple: Like most knowledgeable observers at the beginning of the general election campaign, Donahue and company figured Trump was going to be a stone loser, dragging Republican control of the Senate and maybe even the House right down to the bottom of hell alongside his bizarre garbage-fire of a campaign. So it became more important than ever to anti-Trump Republicans to invest heavily in the rest of the party. And they did, from the Chamber to the Koch network and back again. But now this particular chicken has come home to roost: The Chamber and other Republican interests originally hostile to Trump undoubtedly helped him win by boosting Republican turnout, and have now given him a Republican Congress that could wind up rubber-stamping his agenda. Mr. President-elect, our country needs a strong president to help ensure peace, security, and prosperity at home and abroad. In the days ahead, we will agree on many issues and we may disagree on a few—but we share your commitment to this country and we stand ready to work with you and the new Congress to unleash a new era of growth and opportunity. Translation: If you give us most of what we want, we’ll look the other way when you insist on things we don’t like. And so the Chamber’s relationship with Trump is one of those many phenomena that will depend very strictly on how the new administration gets along with congressional Republicans. If GOPers at both ends of Pennsylvania Avenue can agree on a common agenda of big tax cuts, regulatory “relief,” attacks on unions and pro-union policies, and a general rollback of the New Deal and Great Society programs to the extent that is politically possible, then the Chamber probably won’t get too upset if its trade and immigration preferences are ignored. We should find out any day now if Paul Ryan, Mitch McConnell, and the Trump people have reached agreement on a FY 2017 budget reconciliation bill — probably focused on repealing Obamacare — that will represent the first installment of this agenda. If the deal is cut and you see the Chamber whipping that reconciliation bill madly, it is going to be a pretty good sign that the business lobby’s big priorities will be acted on before too long, with the details already being drawn up. And then, we will also know that Republican interest groups like the Chamber are getting their money’s worth for their investment in the GOP this year, even if it involves swallowing insults and the occasional policy heresies from the orange devil sitting in the White House who is also their new best friend.